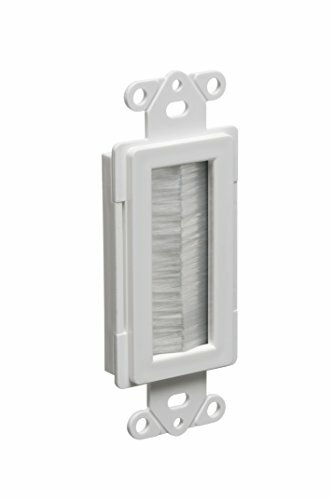 Arlington CED135-1 Cable Entry Device with Brush-Style Opening, 1-Gang, White, 1-Pack. Used to organize and protect low voltage cable when passing through the wall. Accommodates a decorative style cover. Unit is reversible for a recessed look. Includes (2) #6 screws for a complete installation. Comes with 1-unit per pack, Made in USA. The non-metallic CED130 Cable Entry Device with Brush-Style Cover is the newest product in Arlington's SCOOP series of entrance plates and hoods. It provides an aesthetically pleasing installation, while organizing and protecting low voltage cable against abrasion. Plus, mounting holes allow you to attach a decorator-style wall plate to the low voltage side of an electrical box, while providing extra support to the installation. Each package includes (2) #6 screws for complete installation and the entry device may also be installed in reverse for a recessed look.